Let’s say that a company needs to send a technician out to a particular customer who has specific once-off work that needs to be done. The company can design a job-specific form to be sent to the technician’s mobile device. The technician can then capture the job-related data and submit the form once it's completed. The form itself will then disappear from the technician’s mobile device. Since this particular form will never be used again, this is a perfect way to keep the forms list on the mobile device concise and ordered. 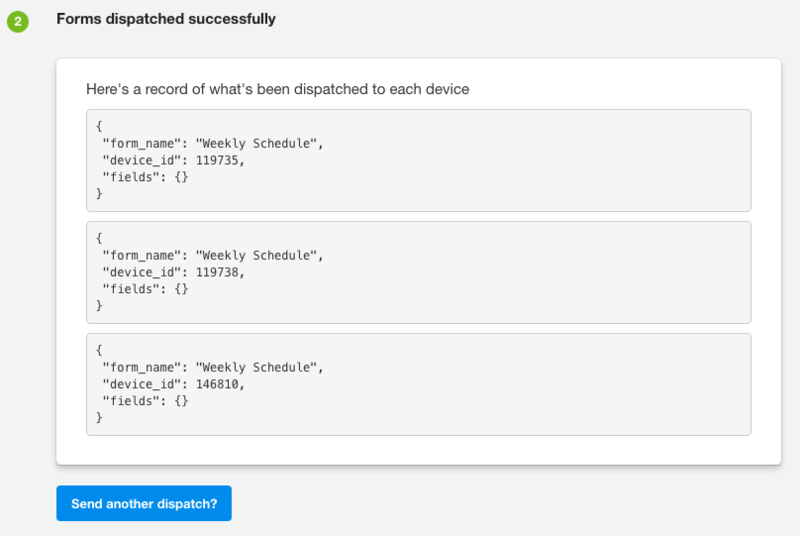 Basically, this multi-device dispatch feature – which is the front end of the Push API – allows a pre-populated form to be sent to a specific device for a one-time job. Once the form is submitted, it is removed from the device. You can access the Dispatch page via the button at the top of your organization page, or by typing “/dispatches” at the end of your account organization link. Click on “Dispatch to multiple devices”. Then, select the form you would like to dispatch. This will start a wizard that begins by asking for an Excel file containing which of the data you want dispatched to which of the available devices. Once you’ve uploaded your Excel document (Stage 1) you will then be taken to Stage 2 where you can match up the columns in your Excel document with the question fields in your form. Now you're able to preview and edit the forms. Once you click on the button that says “Dispatch to devices” you will be taken to a page that states your forms have been dispatched successfully, along with a record of what has been dispatched to each device, and an option to send another dispatch. In the Excel document, there are three mandatory columns that are automatically filled in by Device Magic, based on the information provided by your organization. 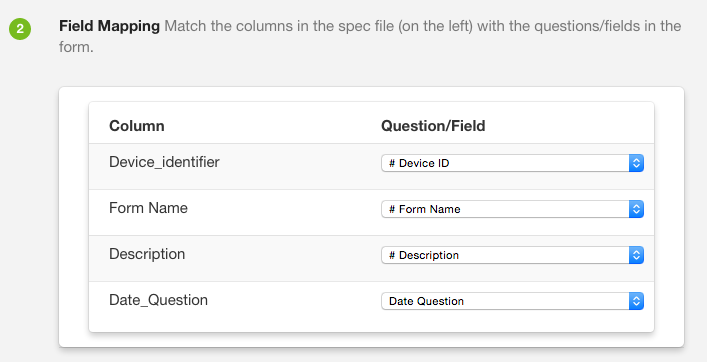 These columns identify the device that will receive the form, the form name and the description of the form. You may edit the Excel document to include other information you need from the form. All form field types are able to connect up to the Excel document and data in the Excel document is updated as soon as the forms are submitted. For more information on Push API, click here. 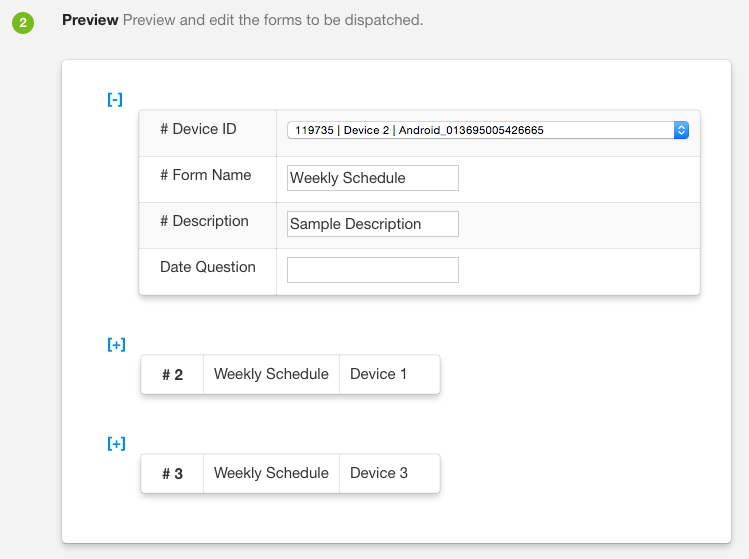 For a demo video on the Dispatch UI, click here.